Sports Bars (and Beyond) Where You Can Watch NCAA Basketball in Raleigh, N.C. Snag the best seats in Raleigh, N.C., for March Madness action. You can experience the 2016 NCAA Division I Men&apos;s Basketball Championship First and Second Rounds live, March 17 and 19 in Raleigh at PNC Arena. Get tickets here! And take in the rest of the tournament at the area&apos;s nightlife venues and breweries. We&apos;ve tapped local blogger John Huisman (a.k.a. "The Triangle Explorer") to give us a rundown on great places to watch the madness unfold. A Raleigh institution since 1951, The Players&apos; Retreat (known to locals as "PR"), is an unassuming bar and restaurant that&apos;s prime real estate for watching college hoops. If a local team is playing, arrive early—space is limited, but they offer outdoor TVs and seating if you can&apos;t land a spot inside. And while you&apos;re there, you&apos;d be remiss not to grab an order of Mimi&apos;s Sausage Dip—it&apos;s been featured in Southern Living and on the Cooking Channel! 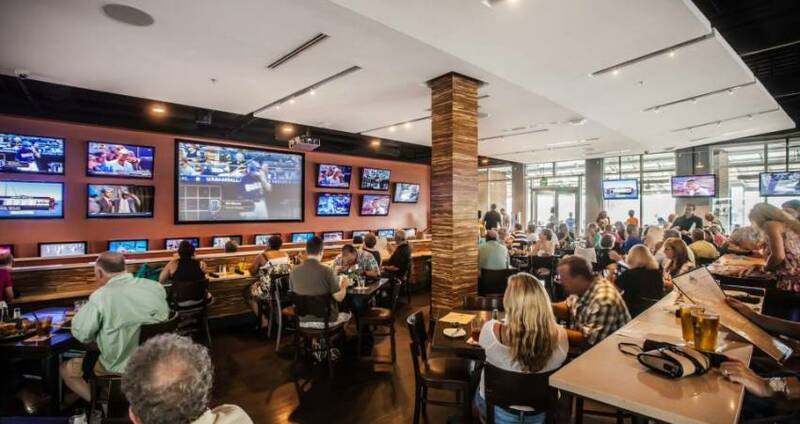 Tobacco Road Sports Cafe was founded on the idea that your favorite place to watch a game can also be your favorite place to grab a bite—add in their wall-to-wall TV screens and row of plush recliners, and you have a local hot-spot for cheering on ACC teams. If you&apos;re visiting for the first time, grab a couple appetizers to get a taste of local favorites like the Tobacco Road Nachos or Wolfpack Wings. If you&apos;re looking for an upscale-yet-casual viewing experience, check out Yard House, a sports bar featuring more than 100 beers on tap and 140 dishes. A fleet of flat screen TVs is strategically placed throughout the space and visible from nearly every seat in the house. Offering a mix of classic sports bar food and Southern home cooking, High Park Bar & Grill, features 22 HD TVs inside and seven more on their covered patio. Before or after the game, or during halftime, check out their video games, darts and pool tables. Area breweries like Big Boss Brewing Company and Neuse River Brewing Company won&apos;t make you choose between a great beer and a great game. And they offer TVs for big match-ups. Call ahead to make sure they&apos;re planning on showing your must-see games. Blogger John Huisman moved to Raleigh just over 10 years ago and started his blog, The Triangle Explorer, as a creative outlet to share pictures and thoughts about local culture and events with a focus on the arts, entertainment and dining scene.